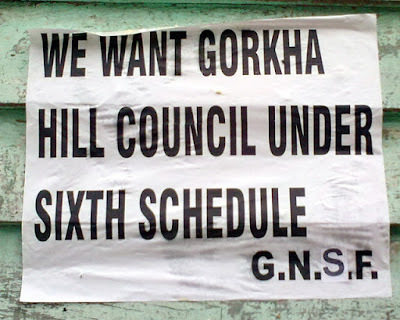 Darjeeling: The campus front of the Gorkha National Liberation Front said on Monday that it wouldn't involve students in political activities as education had suffered the worst during the recent 104-day Gorkhaland strike. In November, the Gorkha Janmukti Morcha had said teachers wouldn't be asked to participate in agitation programmes. Abinay Gurung, the convener of the Gorkha National Students' Front, on Monday said: "We have decided not to involve students in political activities. The decision will be applied even to college students. We also appeal to other political parties to take a similar stand." Gurung went on: "Following the recent 104-day shutdown, we have seen that it was the students who suffered the most. Education took a backseat during the agitation. We cannot let students suffer any longer." During the latest Gorkhaland agitation, school and college students were seen attending marches and meetings. The West Bengal Commission for Protection of Child Rights had taken suo motu cognisance of children hitting the streets during the agitation and issued a notice to Bimal Gurung on the issue. The hills are known for educational institutions which have students from countries like Thailand, Bhutan, Nepal and Bangladesh. Academics believe the hill schools are slowly losing their glory because of continuous strife. "Many students are now preferring schools in Siliguri to those in the hills. Schools in the hills are losing their sheen and we fear we might lose many students in the next academic session because of interruption in studies this year," said a school teacher. The campus front of the Gorkha National Liberation Front said on Monday that it wouldn't involve students in political activities as education had suffered the worst during the recent 104-day Gorkhaland strike.